Throw your little princess a fairy tale princess theme party she'll always remember, with a flick of your magic wand! 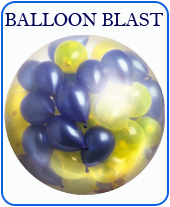 Avoid exposing balloons to extreme heat or they can burst. Also do not over inflate. Important information: 10 pieces in a pack , " Princess theme"- Screen Printed All Over, 30 cm or 12 inches dia in size, Pastel white, light blue, aqua marine, mustard color Assortments*, 14.4 Litres Volume with Floating Time of 20 hours**.